I think in 5 years, this is the first time Rituals has appeared on MANFACE. A Dutch brand, inspired by Japanese rituals and skincare – it’s a bit of an odd one. Their products sit in that ‘masstige’ market alongside The Body Shop and Yves Rocher et al. They’re still not massive in the UK, with a mixture of stores and I’ve spotted them in House of Fraser every now and then – they’re much bigger on the continent and pretty big in Spain where I’ve seen them a fair few times. 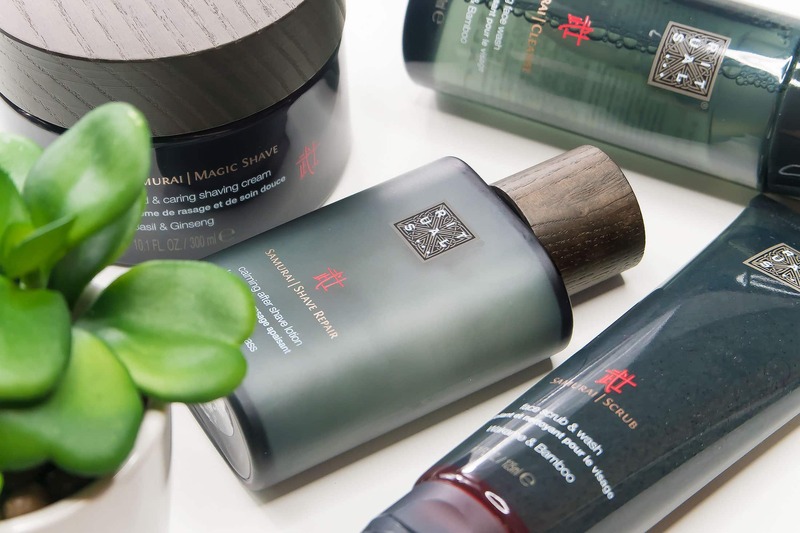 The Rituals Samurai collection is a no-nonsense grooming regimen with some pretty sturdy, everyday products with very interesting formulations. Whilst the formulations are still pretty basic, they throw in a few cool ingredients such as ginger, Centella asiatica (an Asian wetland herb) and Asian Beefsteak plant (part of the mint family). I’ve been taking a look at 4 products including the foaming face wash, calming aftershave lotion, caring shave cream and the face scrub/wash. All products have a very traditional masculine fragrance – with woodsy herbal notes. Out of the 4, I particularly enjoy the Afterhshave lotion with a water, aloe and aluminium starch base which makes for a very calming post-shave soother being very lightweight and refreshing. Then there’s the foaming face wash with no real notable ingredients except aloe, bamboo extract and wakame seaweed – very cleansing but not stripping. I think the collection would make a great Christmas gift, they’re solid all rounders and particularly good if buying for someone who’s skin type your not too certain of. These products and the rest of the collection can be found here online at Rituals online. This article first appeared on MANFACE written by Thom Watson. It was published on Sunday 11th September 2016 and was last updated on Monday 3rd April 2017 at 12:43pm. It's categorised under Razor Burn / Shave Rash, Shave where you'll find more related content.